Bonjour tout le monde! Je suis Sandy, et j’ai un tableau por vous aujourd’hui! 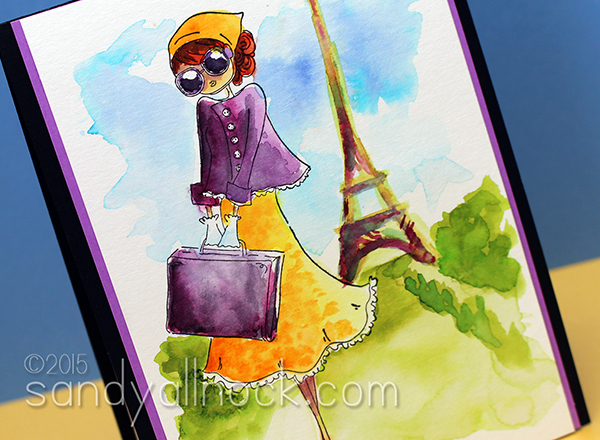 Peerless watercolor, heading for a peerless city: Paris! I’m practicing a little of my college French…ooh la la! I hope I remember more of it by the time I arrive in Paris this afternoon. I was blessed to discover that during the recent (ugh) news from Paris, I was able to almost completely understand newscasters speaking French…though I’m challenged to say much of anything anymore! Oh my French teachers would be so sad. But maybe it’ll be like riding a Parisian bike! In the video I’ll show you my first Peerless watercolor painting of an actual person image…I’ve done techniques, flowers, and a little object here and there, but this is more ambitious than I perhaps should have tried? But it was a fun try at least! This is the 4th take…the others didn’t come out very well, and though this had its challenges, I decided to call it DONE! Enjoy the video below or click HERE to watch it in HD on YouTube! I’ll let you know how my little book for my Peerless Watercolor set works out; the Bonus Pak (Small) is the one I purchased but I linked you to some other options too. You can google for storage solutions for the other size of Peerless too, but know that these “2×2” pieces are actually a little larger. They appear to be handcut, since each is different – which, to me, is a nice thing, I like feeling as though someone cut a chunk of painted paper especially for me, and that it wasn’t some “perfect” machine. In the video I show you what I did with my extra pieces that had to be cut off. Have you tried Peerless watercolors yet? Or is there another type you love to paint with? This is so fun! I just love these uptown girl stamps. Hi Sandy! I know you’re having an amazing time and I love this water color. Every time I visit your blog, I find myself watching many videos. I love that you dabble in different mediums. Love all of your videos. Just love watching you do watercoloring! The image came alive with your magic brush. that is adorable..my granddaughter would love this….someday her dream is to travel the world. Good Morning, I have enjoyed your trip to Europe and the watercolor videos. I liked the girl done with Peeerless.Very Nice. Love your posts–wish I could be there in Europe with you! Beautiful, loose watercoloring with such an eye for color and balance. I love watching you create. I don’t do much watercoloring and I haven’t tried Peerless yet, your video has inspired me. I love the image and what you have done with her. She does remind me of you: might be the glasses…. Hoping you kick that darn cold SOON! Hugs! LOVE the way this came out and your watercoloring is amazing! Also enjoyed your vision of a handcut watercolor paper “chunk”! WOW! I loved watching this video and learned a lot! She is sweet! Hope your cold disappears! I’m enjoying seeing your travels on instagram and here. As a Brit who lived in America for 3 years, I’d love to hear your impressions of the countries you visit – what you liked, what you didn’t, and what struck you as strange or the most different from America. I always think its fascinating to see your own country through someone else’s eyes – they immediately notice things you don’t – like the black/grey coat situation. My immediate thought when I read that was “Do coats come in any other colours? !” Enjoy the rest of your trip! Can’t wait to watch this video, LOVE this stamp! hope you wlll feel better very soon…. Sorry that you aren’t feeling well. This painting is amazing! I love my peerless but use it mostly for backgrounds. I need to work up the courage to branch out and use it on actual scenes. Enjoy your time in Paris. The city if magical and the food is wonderful. forgot to ask you something over on Youtube….so have you gotten yourself this yellow dress in Paris?? We all know that yellow is your favorite color! Soooo hope that you are feeling much, much, much better! I haven’t done a bit of shopping yet on this trip—crazy!! Oh Sandy, you look so stylish with your yellow dress, purple jacket and beautiful red hair. Have a fantastic time in Paris!! Beautiful card!! Love what you did with it. Loved the coloring with the peerless watercolors. Thank you for introducing them to us. Hope you are feeling better. I do not have these watercolours but wow what a card. Love it! I’ve been having fun playing with my watercolors too! Enjoy Paris! Love the color choices. Thanks so much Sandy! Amazing…just gorgeous. Hope your visit to Paris is tres jolie. Feel better, Sandy! SOON! I think the watercolor image looks fabulous. I admire your courage to just dive in and go for it–no procrastination or self doubt. Hope a good night’s rest has you feeling much better in the morning! Your posts while on vacation have been amazing! Enjoy Paris! You blew my illusion of you sitting on a park bench on a beautiful, warm, sunny spring day looking at the Eiffel tower in the distance as you paint this, (oh yea, with cherry blossoms falling all around you,lol.) What a very special card this will be for a very special someone in your life. Beautiful! For the first time I have been playing with watercolors–I have a lot to learn. Beautiful card! I haven’t tried Peerless Watercolor, but this makes me want to get my paints out. Thanks for the inspiration! Hope you are feeling better. I just love this! You are so inspiring! I may actually break out my watercolors and try! Hope you are feeling better! Have fun. Oh no…..poor you getting a cold. Hopefully, it will be minor and you will be better today. Didn’t watch vid yet, but I think this looks tremendous.